Daily FBM KLCI chart as at November 9, 2018. Global markets indices and commodities performances as at November 9. Two weeks ago, the Bursa Malaysia rebounded from a bearish down trend but started to fall last week despite a bullish start. This indicates that the market sentiment is still bearish. The local market performance was in line with the global market performance. Falling commodities prices, especially crude oil and crude palm oil has dampened market confidence. The FBM KLCI fell 0.3 per cent in a week to close 1,708.09 points last Friday. Trading volume declined and this indicates that the market is being cautious. The average daily trading volume has declined to 2.2 billion from 2.4 billion shares in the previous week but the average daily trading value rose to RM2.5 billion from RM2 billion. This indicates more higher-capped stocks, which are normally traded by institutions, were being targeted. Last week, institutions were selling to the retail. Net sells from local institution and foreign institutions were RM189 million and RM183 million respectively. Net buy from local retail was RM372 million. In the FBM KLCI, gainers outpaced decliners three to two. The top gainers were Westports Holdings Bhd (6.2 per cent in a week to RM3.77), Axiata Group Bhd (4.4 per cent in a week to RM3.58) and KLCC Property Holdings Bhd (4.2 per cent to RM4.45). The top three decliners were Genting Bhd (5.8 per cent to RM6.78), MISC Bhd (3.7 per cent to RM6.45) and Malaysia Airports Holdings Bhd (2.7 per cent to RM8.03). Markets were generally bearish last week. In Asia, China markets including Hong Kong took the lead in the declines. However, Japanese market were almost unchanged. Markets in Europe and UK also closed lower. However, the US market rebounded and closed higher. US dollar were firm against major currencies. The US dollar Index (which measures the US dollar against major currencies) increased to 96.9 points last Friday from 96.5 points the week before. The Malaysian ringgit also stayed firm against the US dollar at RM4.17. In the commodities market, prices of gold and crude oil fell. Price of gold in COMEX fell 2.0 per cent in a week to US$1,210.30 an ounce and Brent crude oil fell 3.8 per cent to US$69.88 a barrel. Palm oil in Bursa Malaysia fell 5.1 per cent to RM2,042 per metric ton on demand worries. The FBM KLCI faced resistance at 1,726 points after rebounding in the past two weeks. The previous resistance level was at RM1,742 points. The lower resistance levels indicate that the market trend is bearish. The immediate support level is at 1,670 points, which is the support level three weeks ago. Technically, the market is in a bearish trend. The FBM KLCI failed to climb above the short term 30-day moving average after the rebound. 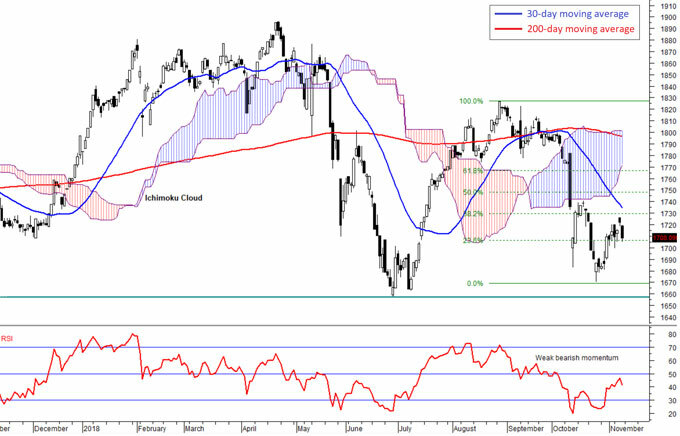 Also, the index stays below the Ichimoku Cloud indicator and is now at the transition of the Cloud. This indicates that the trend is set to continue its bearish trend. Momentum indicators were increasing in the past two weeks and indicate a weak bearish trend. The RSI and Momentum Oscillator indicators have rebounded to near their mid-levels and this indicates that the index is now at the resistance level based on the RSI indicator. However, the MACD indicator remained above its moving average and increasing and this indicates that the momentum is still good. The failure to overcome resistance levels in the two weeks rally indicate that the market is not out of the bearish trend yet. With the technical indicators show that the market is still bearish, the FBM KLCI is expected to continue its bearish trend towards 1,670 points if it fails to climb above 1,742 points. The above commentary is solely used for educational purposes and is the contributors point of view using technical al analysis. The commentary should not be construed as an investment advice or any form of recommendation. Should you need investment advice, please consult a licensed investment advisor.